This week, I’ve had the pleasure of working with two different SSD drives; one from Promise Technology and the other from OWC. NOTE: You can read my OWC review here. The M4 is designed for portability and, when equipped with SSD drives, serious performance. 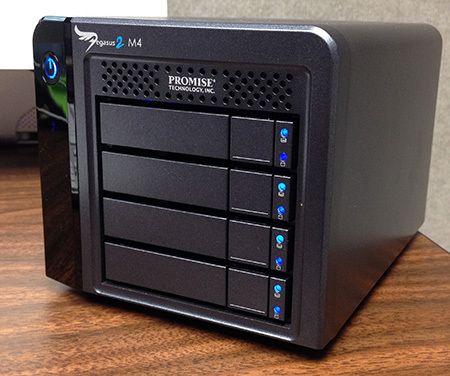 Using the included Promise Utility, the system can be configured as RAID 0, 1, 5, 6, or 10. Sporting two Thunderbolt 2 ports, it can store up to 4 TB using standard hard drives, or 2 TB using SSD drives. 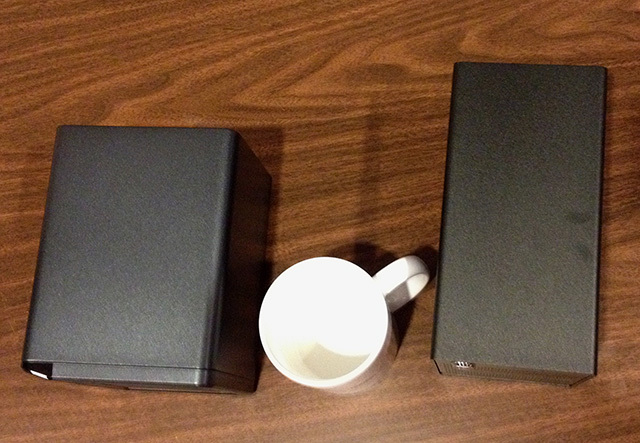 It weighs less than six pounds, is about the size of two coffee mugs, and comes with a 2-year warranty. If you are looking for something small, light, really fast, and reliable, this is the drive to consider. However, the Promise website highlights data rates exceeding 1300 MB/second. I was not able to come even close to that. Since I had both the Promise and OWC units here, I thought it would be interesting to compare the two for size. (The Promise is on the left.) The Promise is about an inch wider. But it is also about an inch-and-a-half less deep.